Relax and “let the train take the strain” as you explore a world of green pastures, wooden chalets, forests and distant peaks, as you take a trip along some of Austria’s most memorable vintage rail routes. Visit Innsbruck, and enjoy warm Tyrolean hospitality as you stay amid the green valleys of the Zillertal Alps. Fly to Munich and transfer to your hotel in Ried im Zillertal, which lies at the heart of the Zillertal Valley, surrounded by green meadows and forested hills. 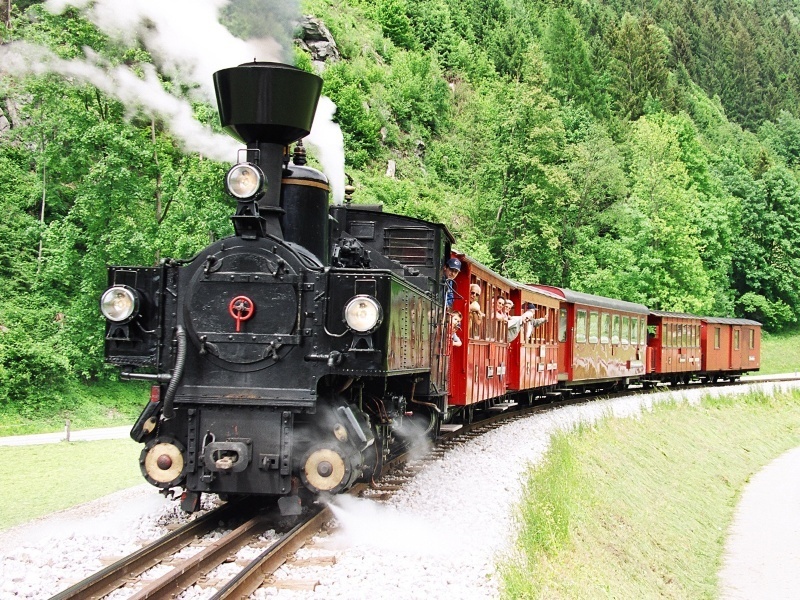 Join today’s included excursion on the historic, narrow-gauge Zillertal Steam Railway*. Enjoy a glass of warming schnapps as you journey through stunning Tyrolean scenery from Jenbach to the chic ski resort of Mayrhofen, in the shadow of the great Hintertux Glacier. Explore the resort, or perhaps take a cable-car ride (payable locally) and enjoy the panorama from the terrace of a mountain restaurant. Discover Salzburg – the ‘Sound of Music’ city and birthplace of Mozart – on today’s optional excursion. Beneath the imposing Hohensalzburg castle and beside the Salzach river, Salzburg is a treasure-trove of onion-domed churches, elegant squares and cobbled thoroughfares. Don’t miss the Castle, which towers 400 feet above the city, and offers predictably wonderful views, or the exquisite Dom cathedral with its frescoes. Today’s destination is the imperial city of Innsbruck. We’ll enter the city through the triumphal arch built to celebrate Archduke Leopold’s marriage, and our guided tour will reveal the old town, elegant Maria-Theresien-Strasse (the main street) and the famous copper-tiled ‘Golden Roof’ built for Emperor Maximillian I. Stop for coffee and cake at one of the cafes before we continue to the Olympic ski-jump at Bergisel, and onward to Ambras Castle, in the hills above the city, to see the exquisite portraits and carvings of the Spanish Hall and the bizzare paintings in the Chamber of Art and Curiosities. Rest and relax in Ried im Zillertal today, or join our optional excursion to Tratzberg Castle. Perched high in the woods above Jenbach, the 500-year-old castle’s white walls protect a beautifully preserved Renaissance courtyard and the ornate genealogical murals of the Habsburg Hall, and are reached by a ‘tourist train’ from the castle inn below. Later, see skilled local craftsmen at work blowing glass, working with crystal and – most important – taste traditionally baked Apfelstrudel on a stop in the Tyrol’s smallest town, Rattenberg. On today’s included excursion we’ll ride the Achenseebahn’s narrow-gauge cog railway* from Jenbach to Lake Achensee. The lake is the Tyrol’s largest body of water and its beach-fringed, wooded shores are popular with local bathers, and you’ll have time to relax here, or board a lake-steamer for a cruise turquoise waters (payable locally). Our final optional excursion includes a ride on the historic Pinzgauer Lokalbahn, beneath the Kitzbuhler Alps and through Hohe Tauern National Park to the Krimml Falls. Walk to the foot of the falls, and follow the path up the Krimmler Ache valley alongside the three-tiered torrent, before we return to Ried im Zillertal for a final dinner at the hotel. Say goodbye to your Tyrolean hosts, today, as we board the coach and return to the airport to catch your flight home.